The work was done as a study in preparation for Battery—Halt! where this same group of figures can be seen on the left-hand side of the painting. It is the largest and most detailed of all surviving preparatory sketches by Trego. One unusual aspect of this study is that the faces of the soldiers seem somewhat incomplete, while the faces of some of the horses are quite detailed. This same treatment was carried over into the final work. 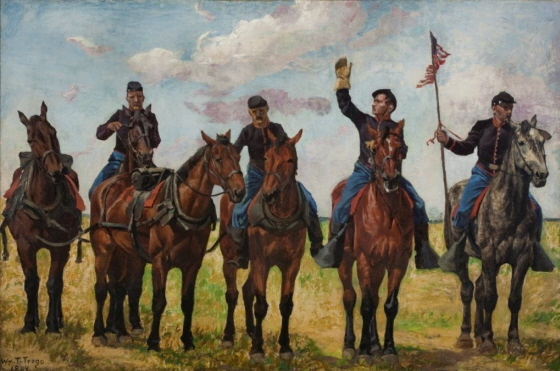 The painting was at one point misidentified as The Color Guard. Owned by Harry O. Eichleay of Pittsburgh, who transferred it to his daughter, Helen E. Siegwarth, who sold it to the Mellon Bank in Pittsburgh in 1971. Mellon Financial Corporation sold it in 2006 to Robert Welch in Bucks County, Pennsylvania, who then sold it to the current owner in 2007.